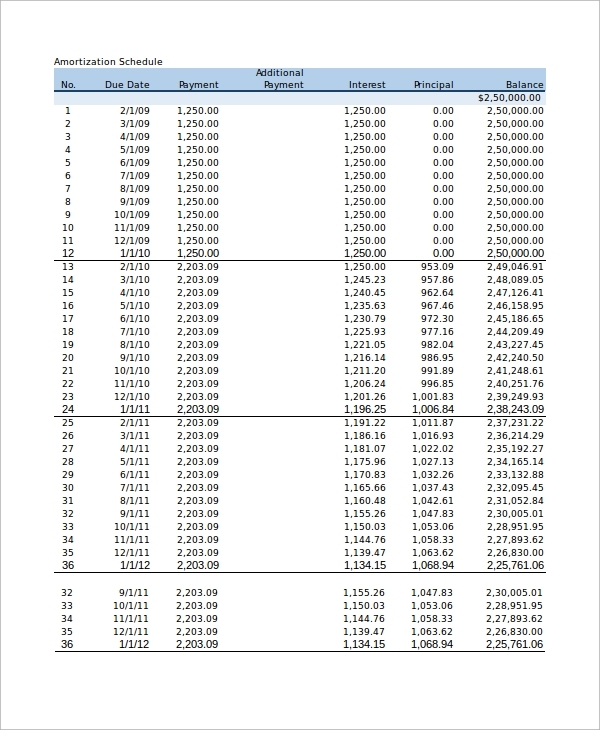 Professionals in financial institutions like banks and personal loan providers often use an Amortization Calculator in Excel to know the details about a particular loan. One can obtain the amounts of repayment from this calculator based on weekly, monthly, and yearly terms. 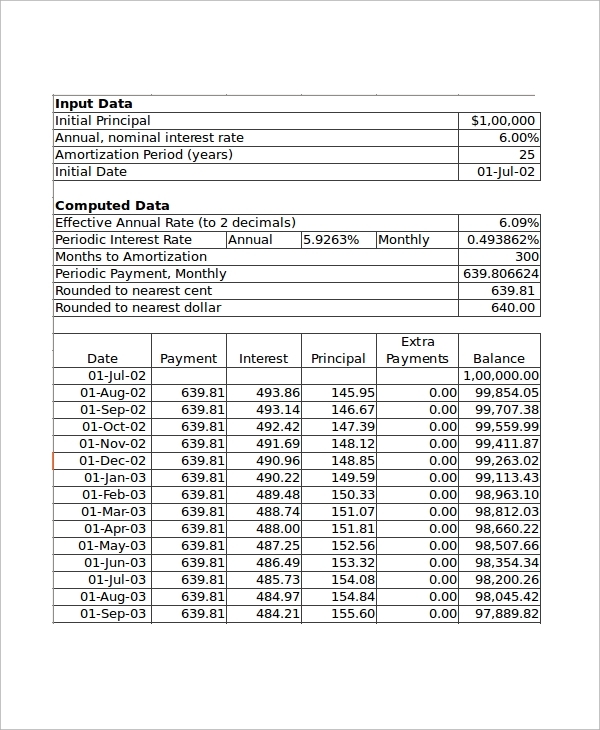 The Amortization Table Excel Samples simplify the complex numeric values related to a loan and help the professionals to explain the benefits and terms of repayment of a loan. Check out the following calculators along with their benefits. This loan calculator is used to know the exact amount of money that a person still owes to the lender after each payment is made. You can also know the total number of payment you need to make. 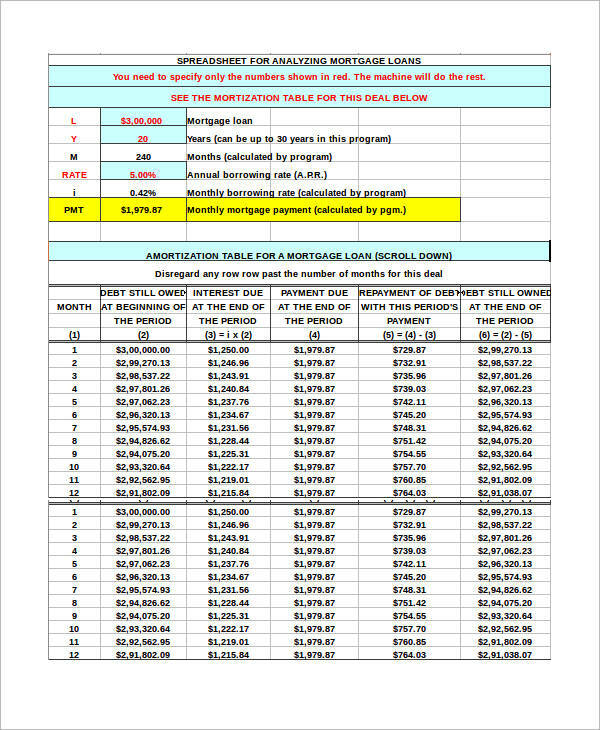 This template is designed in such a way that you can know all the necessary information about a loan amount at a certain point in time. You can obtain all the results with different amounts of principles and variable rates of interest. 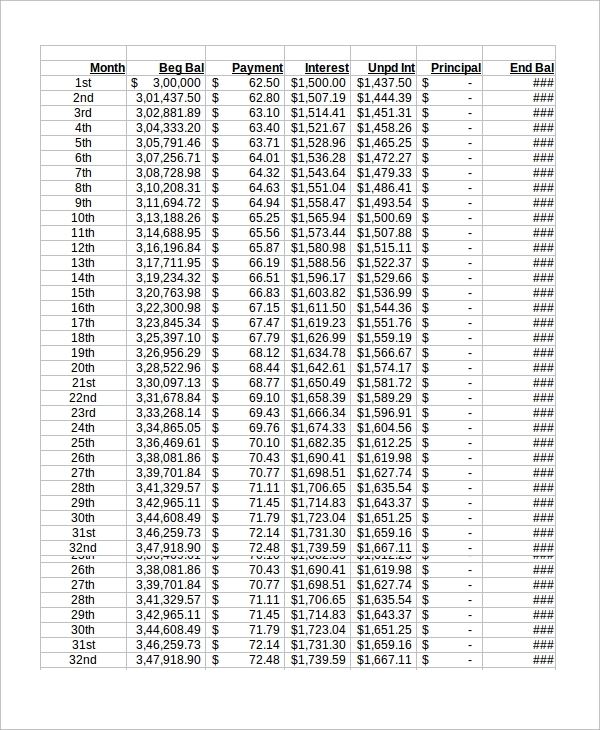 This Amortization Schedule Excel is easy to comprehend as it has only four columns. These include the month, interest, loan to be repaid and so on. You can also obtain the total number of payments you need to make. Why are the Loan Calculators Required? Financial aspects need to be dealt with accuracy. When you plan to take a loan to be repaid after a long time, you need to know the amount of money that is to be repaid per month or on a quarterly basis. 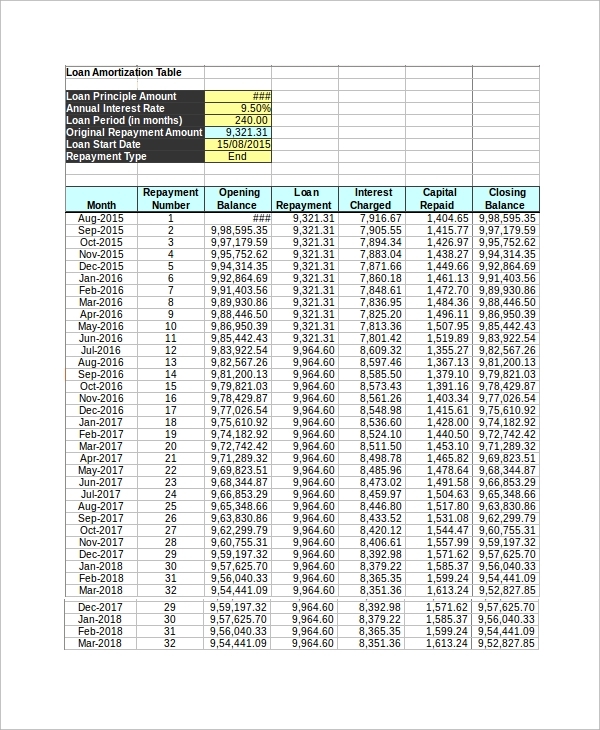 The Loan Calculators in Excel have various inputs like customizable rates of interest, editable time period, different principle amounts and so on. They also display the total number of payment you have to make. All these help you to plan your finances well and make the payments on time. 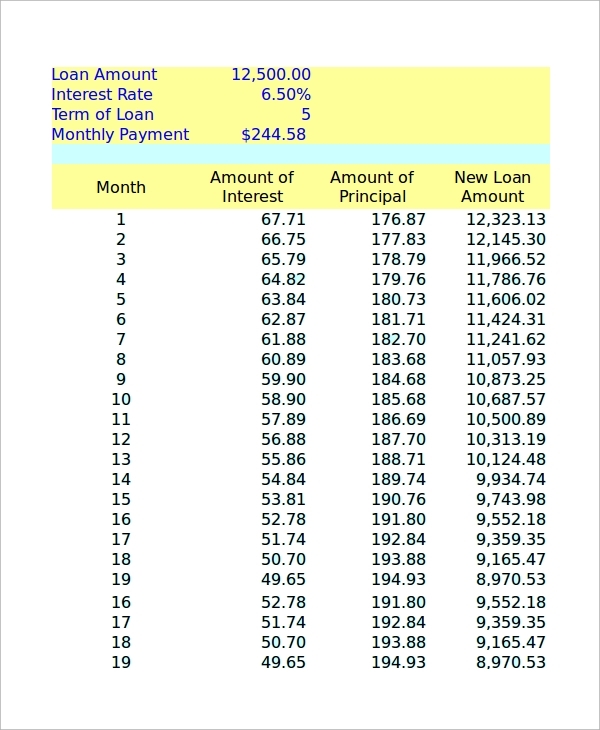 Planning a loan repayment schedule requires accuracy, and these calculators help you to achieve the same. One can calculate the amount of payment required per month to repay the loan. This calculator can obtain information on the remaining principal, interest, rate of payment and so on. One can know the beginning balance and end balance before and after a payment is done from this calculator. Other details like interest per month and the remaining number of payments to be made are also available here. What Information Can You Yield from these Calculators? Business firms and individuals need various amounts of loans, and you can calculate the repayment amount and make the payment schedule for any amount with the help of these calculators. You can customize the frequency of loan repayment. For instance, you can choose daily, weekly, fortnightly or any other schedule for the repayment scheme. You can also see Sample Wedding Budget Calculators. If you are a lender, you can calculate the interest using different rates of interest. Apart from this, these calculators display the amount to be repaid after each transaction. They also show the amount of principle that you still need to repay at any point in time. A loan calculator has benefits for both the borrower and lender. You can check out a Retirement Withdrawal Calculator from the website if you want to plan for your future. The website has various Sample Wedding Budget Calculators and Sample Time Card Calculators, and you are free to download any of these documents as per your requirements.